12/21: The Oak Leafs host the Capitals for a Friday evening game. We would like to recognize all alumni players in attendance that night! Please come out to the game and be sure to let us know you are there so we can recognize you (Contact Robbie George (former Oak Leaf and current Asst Coach via text/call @515-362-1325 or email desmoinesoakleafs@gmail.com). 12/22: Starting at 3PM we will host an alumni game. 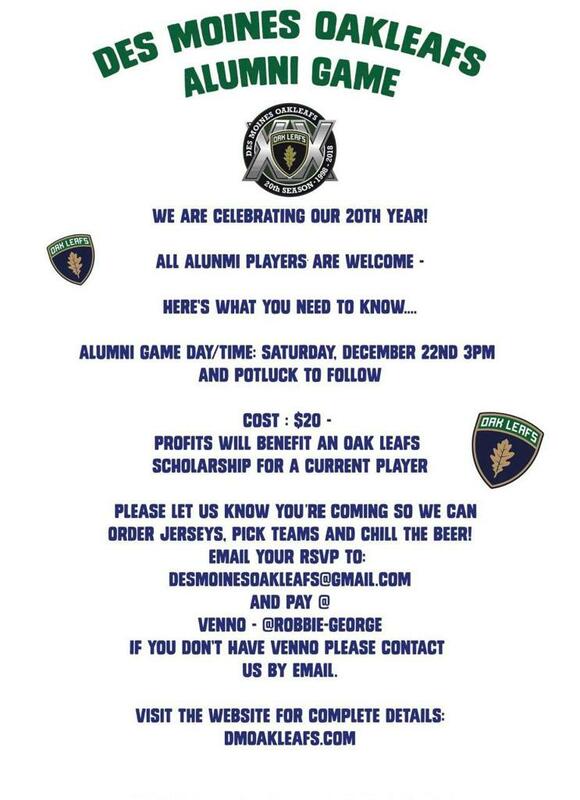 We plan on having 2 one hour games played: a game with some current and recent Oak Leafs and a second game with an older group of Oak Leafs alumni. We will celebrate afterwards with a potluck. ALL ALUMNI FAMILY MEMBERS ARE INVITED TO ATTEND! We draft families--not just players! Please spread the word to any former Oak Leafs to participate and make this a great weekend to celebrate the Oak Leafs! See the flyer below for details on how to register to play!